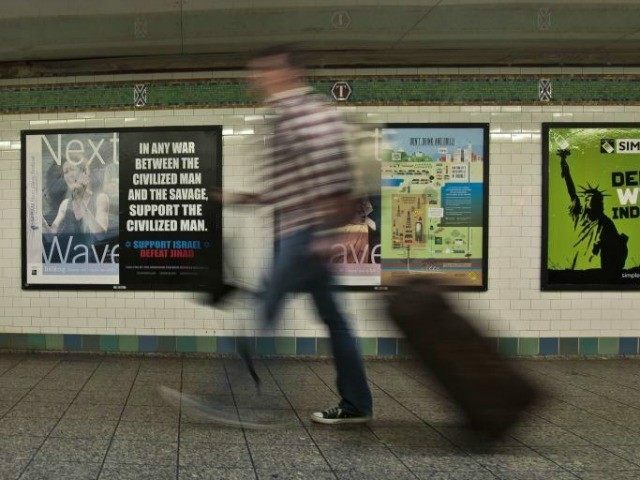 28 May 2015 Washington D.C.
On Thursday, Washington D.C.’s mass transit authority decided that, instead of being forced to sell ad space for a free speech campaign featuring the winning entry of the “Draw Muhammad” art contest, they would put a ban on all PSA and advocacy advertising for six months. The drawing was the winning entry in Pamela Geller’s “Draw Muhammad” art contest and free speech celebration that was held in Garland, Texas, earlier this month. The event was interrupted by gunfire when two jihadis tried to crash the event and murder its participants. Both were quickly dispatched by local police and security guards and caused little damage. As to the bus and train ads, courts in several jurisdictions have repeatedly ruled in Geller’s favor, telling mass transit authorities from coast to coast that they must allow the ads if they take any PSA or issue advocacy ads at all. Regardless, as of Wednesday, May 27, the Muhammad ads are not going to appear in D.C.
With its sudden ban on PSAs, the board of the Washington Metropolitan Area Transit Authority took its cues from the Philadelphia transit system which also banned all advocacy advertising in order to squeeze out from under a court order that said it had to take similar anti-sharia ads if they were going to take ads from other advocacy groups. In the end, authorities in Philly decided it was better to forgo millions in advertising dollars than have to take the anti-sharia ads. Metro officials also gave another reason for the ban. They said they feared violence from Muslims. According to Washington Post reporter Paul Duggan, a “Metro official says agency fears a cartoon ad of the Prophet Muhammad would make buses and subway stations ‘terrorists targets. '” And so, with all that in mind, the authority placed a ban on all PSAs through the end of the year. Metro spokesman Mike Tolbert said that the vote on the temporary ban was unanimous but also claimed that board members didn’t discuss any “particular” ads during the debate. Following the cowardly policy change for the New York MTA, the Washington MTA has suspended all issue-oriented ads through the end of year after we submitted our free speech ad. These cowards may claim that they are making people safer, but I submit to you the opposite. They are making it far more dangerous for Americans everywhere. Rewarding terror with submission is defeat. Absolute and complete defeat. More demands, more violence will certainly follow. The message is that terror works. “This is sharia in America,” she added. At least one past member of the D.C. Metro board found the decision to be unique, one never before instituted in D.C.